This architecturally significant 6 BD, 3/2 home is located in northside St. Davids, in the heart of Radnor Township. It offers an outstanding blend of historic charm combined with state-of-the-art systems and updates. Designed by renowned architect, George W. Maher, a pioneer of turn-of-the-century Arts and Crafts design, this c.1897 home features soaring 10 ft. ceilings, stunning millwork, unique custom built-ins, four fireplaces, and gleaming wood floors. An expansive covered front porch offers an inviting location for warm weather entertaining and relaxation. Enter through the distinctive arched front doorway which matches arched millwork and windows throughout the home. The central Entrance Hall unites the first floor rooms and creates open flow for entertaining. The spacious Living & Dining Rooms have fireplaces, built-ins, and tall windows. The large country Kitchen has white Shaker-style cabinets, granite counters, Shaw farmhouse sink, stainless appliances, subway tile backsplash, large island with overhang for barstool seating, and a Breakfast Room. A private Study has arched custom oak & glass French doors, designed to match the original, richly detailed millwork throughout the home. The Sitting Area on the staircase landing features new built-in bookshelves and a cozy window bench. Upstairs, a spacious Master Bedroom with charming fireplace and four closets opens to a renovated, luxurious Master Bathroom with Carrara-topped double vanity, white cabinetry, large glass-enclosed shower, and a restored vintage claw-foot tub. Two more Hall Bedrooms, one with another fireplace, as well as a large Bathroom with fabulous vintage tile, and a spacious Laundry complete the 2nd floor. The 3rd floor offers 2-3 more Bedrooms as well as another renovated full Bathroom. The Lower Level has a finished Play/Exercise Room and a new Powder Room, a large Storage Room, and a unique Room which the sellers used as a Wine Cellar. Expansive, unusually deep .82 acre property with a detached garage and ample space for recreation and gardening. Newer systems, including gas heat and multi-zoned A/C. 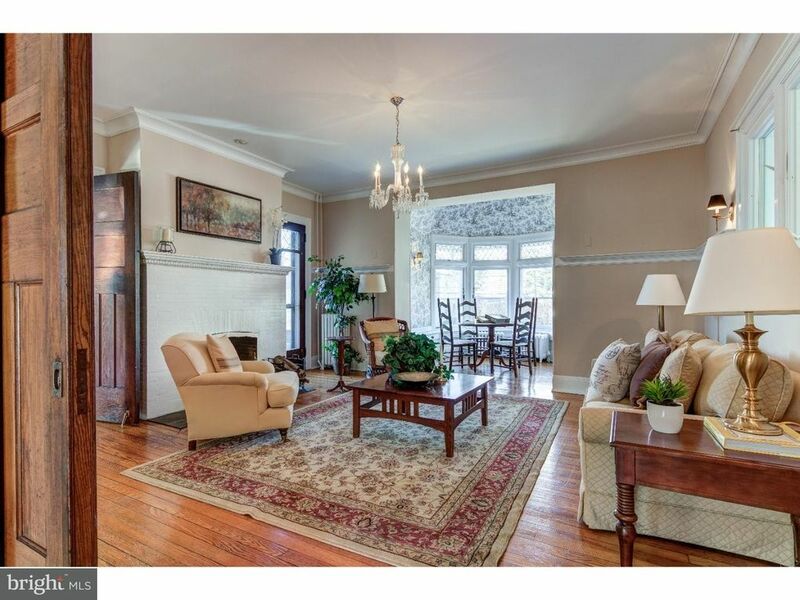 Great location near schools, train, shops, and restaurants in the charming village of Wayne. Convenient to the Blue Route, Center City, corporate centers, and Airport.